Or to give its full name ‘Why The **** Do We Need VAR?’. Yup, it’s nobody’s favorite momentum killer, the Video Assisted Referee. Used for the first time ever in a World Cup Match; VAR was used in the France vs Australia game to review a challenge by Australia’s Joshua Ridson on Head & Shoulders peddler Antoine Griezmann. The Ref initially waved off the challenge and play was allowed to continue, before the Ref then popped over the sideline to watch the tackle again. After 30 seconds the original decision was reversed and France was awarded the penalty, which Griezmann clinically slotted past the Socceroos’ goalie. France would go on to win the game 2-1. Having watched many FA Cup games that were ruined by VAR, I’m still of the opinion that it isn’t good enough (yet) and doesn’t have a place in top-flight football. Decisions should be left to the on-field officials. In sports like hockey and football (the other kind) where there are lots a stoppages, the video ref is more suited, but not here. Football is a game played by people and officiated by people. If FIFA doesn’t trust its own refs, then it should train them better. Friday’s Group B match-up promised to be a belter. Portugal, fresh off winning the Euros two years ago are a strong contender to win the tourney, while former champions Spain opted for the unusual tactic of firing coach Julen Lopetegui just two days before their opening game. 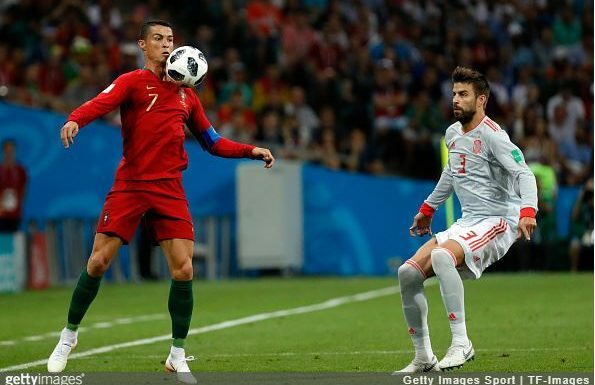 It’s not hard to see why Portugal’s Cristiano Ronaldo is touted as the best footballer in the world, in the team’s nine qualifying games, Ronaldo scored 15 goals, and in the game against Spain, scored a further three, making him the older player to score a hat-track in the World Cup. The five-time Ballon d’Or winner has won everything at club and national level, with the notable exception of the FIFA World Cup Trophy. With 151 caps and 84 goals, Ronaldo is Portugal’s leader in pretty much every outfield metric. This is what makes Ronaldo so exciting to watch, at 33, an age at which most forwards are hanging up their boots, he’s still the fasted man on the field. He also has a point to prove, this is likely going to be Ronaldo’s last World Cup and his last chance to lift that trophy, unfortunately he’s handicapped by playing for Portugal. You don’t score three goals by accident, but you also don’t concede three goals without there being some deficiencies at the back of the park. Iceland, the smallest nation to ever clinch a world cup berth aren’t going out without a fight. With a population of just 348,000, Iceland stunned the world by advancing to the knockout stages of the 2016 Euros and defeating England, before being knocked out by France. Argentina started their game against Iceland with Lionel Messi and Sergio Aguero up front, two of the best strikers to ever play the game. On paper Iceland didn’t stand a chance. Their part time coach (and country’s most famous dentist) Heimir Hallgrimsson insisted he had no plans to counter Messi. But counter Messi they did. Aguero’s 19 minute goal gave Argentina the lead but this was cancelled out four minutes later by Alfreo Finnbogason’s sublime strike. The Icelandic bus was well and truly parked for the next 70 minutes and the game finished honours even. Iceland didn’t even have a shot in the second half. Argentina had chances, Messi was awarded a penalty but his weak shot was placed right into the hands of Iceland’s heroic goalie Hannes Por Halldorsson. Somehow Iceland, in their first ever World Cup game, had destroyed the confidence of some truly great players. Every pass was chased down, every tackle was fiercely contested. It was a great game to watch. That’s right. After a weird Robbie Williams concert, the two lowest ranked teams played the tourney’s opening game. In 2014 it was Brazil vs Croatia. That was an opener. In a misguided attempt to boost their chances, in January the Saudi FA sent nine players to play in La Liga, hoping that the chance to play against European opposition would give the team an advantage. Unfortunately it didn’t work out and most of the players failed to get any considerably playing time and spent most of their time warming Spanish benches. Still though, Group A consists of Russia, Saudi Arabia, Uruguay and Egypt, so it’s anyone’s guess which teams will make it to the knockout stages. Are you enjoying the tourney so far? Comment below or join in the conversation on twitter. * FA Cup, World Cup, Euros, Super Bowl, Stanley Cup, League Cup… in that order.